To my understanding, MdlDefault.Trained is a 10x1 cell (10-fold). Shown below. 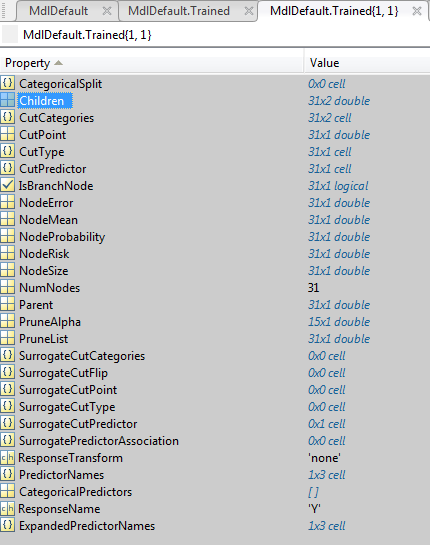 Each cell is an independent regression tree containing all the properties shown below. What does above line mean? I feel it is difficult to understand. 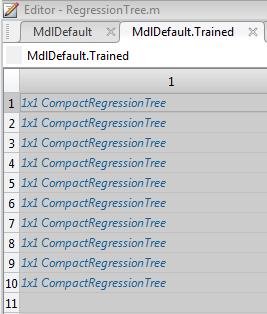 So x is the content of a single cell of MdlDefault.Trained which according to your first screenshot is a CompactRegressionTree. I don't have the stats toolbox so can check what IsBranch is. Since it's not listed as a property, I assume it's a function of CompactRegressionTree. Probably one that returns a logical array.